One service we’re really excited to be able to offer here is Kinesio taping. Kinesio Tape is a special kind of flexible, elastic tape that is water resistant and can be worn for many days. It looks and sounds a little bit like athletic tape, but where athletic tape works to limit the range of motion and support muscles, Kinesio Tape doesn’t limit the range of motion. It actually facilitates motion and reduces pain. It stabilizes the muscles and joints. We use Kinesio Tape in conjunction with physical and occupational therapy, to support the therapy. We’ll use it after a manual muscle therapy or craniosacral therapy session. Following up these sessions with Kinesio Tape enhances the therapy. For instance, after manual muscle therapy, we can use the tape on the soft tissues to prolong the benefits of the therapy. It’s also a great thing to use to help reduce swelling, and it can even be used to help feeding issues when there are imbalances or restrictions around the mouth. Some of the therapists use it for people who have basic muscle imbalances, foot drop, kids who are toe-walkers, or internal rotation of the feet. The Kinesio Tape can stabilize the muscles and joints to enhance their experience in OT. We can vary the amount of tension on the tape, so the tape can have very light tension on it, or more tension, depending on what we need it to do. But the best thing is that Kinesio Tape is totally noninvasive. Many of our kids won’t tolerate anything on their skin, but this tape is very light and easy. We cut a small piece and provide a 24-hour trial for the kids to see if they can tolerate the tape on their skin. If they can, then we’ll try using it after a therapy session. Once the tape on the kids can wear it home. They can wear it all the time, even in the shower. We do show you how to take the tape off painlessly at home. And if the tape does fall off by itself, that’s okay! There’s a lot of work that goes into learning all the different ways Kinesio Tape can be used to benefit therapy and a lot of work that goes into learning how to use it well. We are so excited that we’ve had several people complete all four levels of Kinesio Tape training! Some of our therapists have become Kinesio Tape Certified, and we have other therapists working towards that. 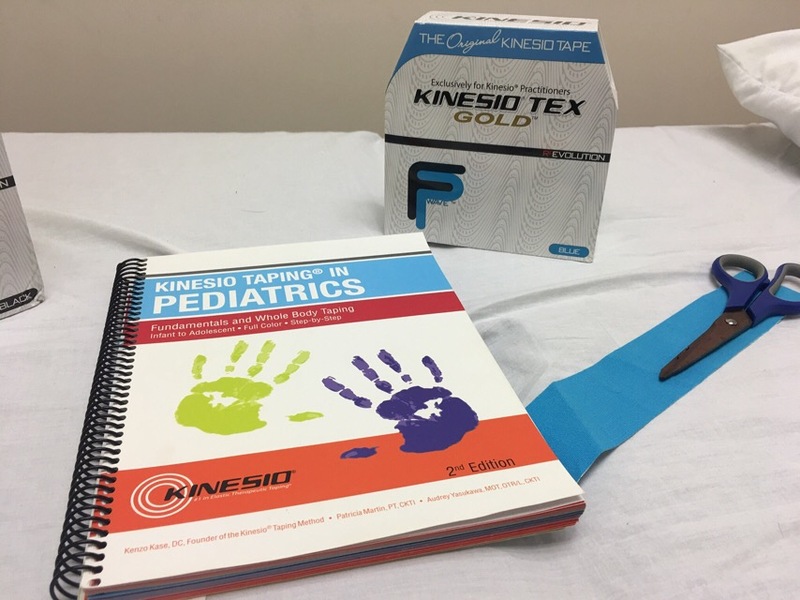 Kinesio Tape is becoming a lot more popular in the therapy world, so we’re very happy to be able to bring the benefits to your kids. Check it out when you come see us. We’ll let you play with a piece of tape, so you can see what it’s like and all the possibilities it has to enhance therapy!